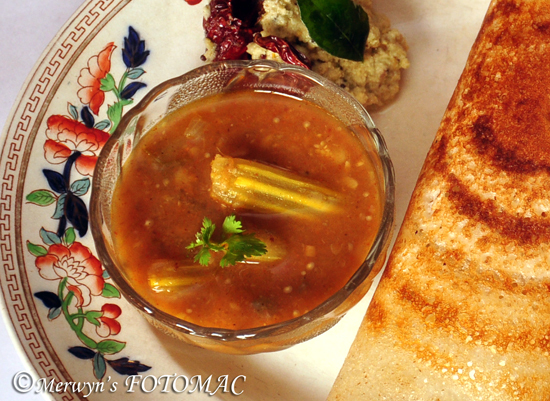 We just love Sambhar & cannot resist South Indian Snacks!! In my home we have it as often as we can… irrespective of breakfast, lunch, evening tea or dinner … When I am in a great cooking mood I make my own fresh masala & use it immediately. I use Everest Sambhar Masala often but make a lot of additions & changes according to the flavor we prefer… but now I have this wonderful masala from Kerala which I will be using for a long time. It is simple & easy to prepare sambhar, but it is absolutely important to maintain a perfect balance while using spices to achieve the ultimate taste as an accompaniment to the various South Indian preparations. Today’s post is for you… to all my dear visitors to enjoy this wonderfully aromatic & lightly spiced lentil stew – Sambhar!! Wash the tuvar dal well & soak in sufficient water in a pressure cooker for about 20 mins. To this dal add a little salt & let it boil without fixing the lid of the pressure cooker. Skim off the froth which rises to the top when there is a rolling boil. To this add turmeric, onion, chopped tomatoes, grated ginger, all the chopped mixed vegetables (potatoes, brinjal, red pumpkin )to the soaked dal & pressure cook till the dal is soft. Boil drumsticks separately & add to the dal to avoid getting mashed. Let the cooker cool slightly. Release the pressure if any & open the cooker. To the cooked dal & vegetables add chilli pwd., sambhar pwd., tamarind pulp, sugar, jaggery & bring to a rolling boil. Reduce heat & let it simmer for about 2-3 mins. Adjust salt to taste. Stir well & keep aside. Heat oil in a tempering pan or any small pan till hot. Add the mustard seeds, curry leaves, hing whole red chillies & let it splutter for a few seconds. Add the onions to this & fry till lightly brown. Add this tempering to the sambhar & give it a boil. Serve with topi dosa, masala dosa, uttappa, medu vada, idlis, or with plain steamed rice. You may include any single vegetable of your choice or any combination of mixed vegetables to prepare the sambhar. You may boil the mixed vegetables separately & then add to the boiled dal if you prefer firm veggies in your sambhar. (I like to boil along with the dal except drumsticks). Addition of small sambhar shallots & drumsticks adds & enhances the flavor. It is important to add molasses if available but jaggery will do. This imparts a unique taste of sweetness to the sambhar. Sugar is optional but if adding tomatoes then it is necessary as it cuts the acidy in the tomatoes. Sugar also helps to add gloss to the sambhar. Freshness of vegetables, spices & fresh curry leaves helps in retaining overall freshness & flavor of the sambhar. Try & use fresh ingredients. Depending on tolerance of spice & tang you may adjust the chilli pwd. tamarind & tomatoes. Tomatoes & Kashmiri Chillies help in bringing out the redness in the sambhar. You may include a combination of dals to make it unique & tasty. Coconut oil imparts a special flavor to the sambhar. If you are not comfortable with it then use cooking oil of your choice.